Renal artery thrombosis with renal infarction is a rare entity. Due to the nonspecific clinical presentation, the diagnosis is usually delayed. We describe such a case in a middle-aged man with membranous nephropathy who was in remission and presented with severe abdominal pain. He was managed with selective intra-arterial thrombolysis with a good outcome. A 42-year-old male had presented with swelling feet and facial puffiness 7 years ago. Evaluation revealed nephrotic range proteinuria (8 gm/day), hypoalbuminemia (serum albumin 2.2 g/dl) with serum creatinine 1 mg/dl. Kidney biopsy (light microscopy and immunofluorescence) showed features of membranous glomerulonephritis. Serology for hepatitis B, C and human immunodeficiency virus was negative. Work up for autoimmune and neoplastic disorders including antinuclear antibodies was negative. The patient was started on oral prednisolone (1 mg/kg/day), tacrolimus (0.1 mg/kg/day in two divided doses) and telmisartan. He achieved remission and prednisolone was gradually tapered off over next 6 months, and tacrolimus was continued for 2 years. Telmisartan was continued along with. He was in remission till his last follow up 1 month before presentation with serum albumin 4.2 g/dl and 24-h urine protein of 0.36 g.
Two days before admission, the patient had developed abrupt onset noncolicky abdominal pain, while working in his office. The pain was initially all over the abdomen but subsequently got localized to the left flank. There was no radiation to groin or testis. He also had low-grade fever, nausea and decreased urine output. There was no history of hematuria, dysuria or passage of stone per urethra, vomiting, blood in stools or distention of abdomen. He was admitted for a day in a hospital elsewhere. A noncontrast CT scan of abdomen done there was reported as normal. On presentation at our hospital, the patient was in distress due to ongoing abdominal pain. He was febrile and BP was 150/100 mmHg. Pulse rate was 100/min, regular with no pulse deficit. All peripheral pulses were palpable and equal in volume with no radio-femoral delay. There was no pallor, icterus, or pedal edema. There was no visible peristalsis or distention of abdomen. Abdominal palpation revealed diffuse tenderness without any rigidity or muscle guarding. Bowel sounds were normal, and there were no bruits. Rest of the systemic examination was normal. Laboratory investigation showed hemoglobin 11.2 g/dl, total lymphocyte count 16,420/cmm, and platelet count 210,000/cmm. Renal function was deranged with serum creatinine 2.5 mg/dl. Total protein was 4.4 g/dl with serum albumin 2.2 g/dl, serum glutamic oxaloacetic transaminase/serum glutamic pyruvic transaminase was 234 IU/192 IU, lactate dehydrogenase (LDH) 4910 IU/L. C-reactive protein (CRP) was 114.29 nmol/L. Urinalysis showed 2+ protein, red blood cell 2–5/hpf, pus cells 3–4/hpf. Urine for spot protein creatinine ratio was 9.23. Echocardiography was normal without any evidence of valvular lesion or thrombus. Serum amylase and lipase were normal. Ultrasonography (USG) abdomen with Doppler study of renal vessels was reported normal without any evidence of stone, hydronephrosis, or thrombosis. As patient remained symptomatic with abdominal pain and there was a strong possibility of a vascular event, computed tomography (CT) angiography of the abdomen was done, which revealed large thrombus extending from the suprarenal aorta to left renal artery with multiple infarcts in the left renal parenchyma [Figure 1]. Right kidney and rest of aorta did not show any thrombus. The patient underwent selective intra-arterial thrombolysis through right femoral approach with intravenous Alteplase 5 mg bolus followed by 15 mg infusion over 1 h. A stent was placed in the left renal artery [Figure 2]. Intravenous heparin with activated partial thromboplastin time monitoring was continued for next 24 h. Check angiogram done after 24 h showed residual thrombus with partial recanalization of the left renal artery. Patient had significant improvement in pain and his renal parameters improved over next 48 h. The thrombophilia workup including factor V leiden mutation test, protein C, protein S, fibrinogen level and antithrombin III activity was normal. Antinuclear antibody, anticardiolipin antibody and lupus anticoagulant antibody were negative. The patient was continued on antiplatelet therapy along with telmisartan. He achieved remission with telmisartan only and his renal functions also improved (serum creatinine 1.2 mg/dl) and remained in remission till the last follow-up 2 months back. Thrombotic complications are well described in patients with nephrotic syndrome due to underlying hypercoagulable state. These are commonly venous thrombi. Cases of arterial thrombi have also been reported, especially in the pediatric population. However, renal artery thrombosis leading to acute renal infarcts in a patient with nephrotic syndrome is a rare presentation. In a large series of 94 patients with acute renal infarct, only one patient had nephrotic syndrome secondary to amyloid light chain (AL) amyloidosis, leading to renal artery thrombosis. Our patient had underlying membranous nephropathy, which predisposed him to a hypercoagulable state leading to renal artery thrombosis. The incidence of renal infarction has been estimated to be 0.007% based on admissions to the emergency department. In another study, the estimated incidence of renal infarction was 0.004% (20 of 481540) among the emergency department census. Various underlying mechanism have been described. One of the recent and largest studies has described 24.5% cardiac causes with atrial fibrillation being the most common culprit followed by thrombi from atheroma of suprarenal aorta and endocarditis. The spontaneous renal artery dissection, fibro muscular dysplasia, Ehlers-danlos syndrome with thrombotic aneurysms of renal artery constituted 30.8% of all cases. The underlying hypercoagulable state due to hereditary thrombophilia, hyperhomocysteinemia, antiphospholipid syndrome, and nephrotic syndrome was found in 16% of the patients while in 28.7% of patients, cause remained idiopathic. Renal artery is the least common site of thrombosis in patients with arterial thrombosis. In a series of 621 patients with peripheral arterial thromboembolism, the upper and lower extremities were involved in 61% cases followed by 29% in mesenteric arteries, 9% in pelvic arteries, and 7% in aorta. Renal artery involvement was least with 2% involvement. The diagnosis of acute renal thrombosis with renal infarct is delayed due to the nonspecific clinical presentation. The most common presenting symptom is diffuse abdominal or flank pain in almost 97% of patients. Nausea, vomiting, and fever is present in 20% of cases. 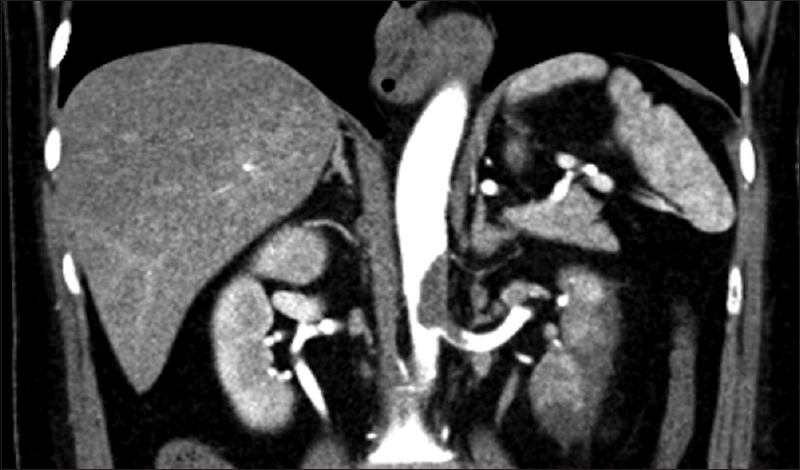 Bilateral renal artery involvement is seen in 16% of cases, mostly in patients with coagulation disorders. New onset hypertension is rare and renal dysfunction is also mild in most of the cases. Microscopic hematuria is reported in 42% of cases. Elevation of leukocyte count, LDH and CRP is present in most of the cases.,,,, This patient initially presented with nonspecific abdominal pain and had leukocytosis, raised LDH and CRP. Various diagnostic modalities have been used for the diagnosis of renal artery thrombosis. Only renal angiography is 100% diagnostic. Renal isotope scan is abnormal in 97% of cases; contrast-enhanced CT is diagnostic in 80% cases; whereas USG has very low sensitivity with positivity in only 11% cases. The common findings on contrast-enhanced CT scan is wedge-shaped, peripheral nonenhancing areas, with presence of cortical rim sign in some cases. With severe involvement multifocal and global infarcts along with mass effect can be seen due to subcapsular fluid collection and edema. The treatment includes intravenous heparin initially and oral anticoagulation as the maintenance therapy in patients with atrial fibrillation and underlying hypercoagulable states. Another modality is minimally invasive percutaneous endovascular therapy with local thrombolysis or thrombectomy, however, there are no prospective trials evaluating the superiority of this approach. Exclusive antiplatelet therapy has also been used in these patients. The prognosis depends on the extent of involvement of kidney and renal dysfunction. The need for hemodialysis and progression to end-stage renal disease requiring chronic intermittent hemodialysis has been reported. Our patient was treated with selective intra-arterial thrombolysis with good results and recovery of renal function. In the presence of the triad of acute onset flank pain, raised LDH levels and presence of risk factor for thromboembolism, IV contrast study should be done to rule out renal artery thrombosis. Renal injury, cardiac causes with atrial fibrillation and hypercoagulable states are most common culprits. Treatment with selective intra-arterial thrombolysis has a good technical outcome. However, its association with good clinical outcome is not well documented. Bourgault M, Grimbert P, Verret C, Pourrat J, Herody M, Halimi JM, et al. Acute renal infarction: A case series. Clin J Am Soc Nephrol 2013;8:392-8. Korzets Z, Plotkin E, Bernheim J, Zissin R. The clinical spectrum of acute renal infarction. Isr Med Assoc J 2002;4:781-4. Cameron JS. Coagulation and thromboembolic complications in the nephrotic syndrome. Adv Nephrol Necker Hosp 1984;13:75-114. Huang CC, Lo HC, Huang HH, Kao WF, Yen DH, Wang LM, et al. ED presentations of acute renal infarction. Am J Emerg Med 2007;25:164-9. Frost L, Engholm G, Johnsen S, Møller H, Henneberg EW, Husted S. Incident thromboembolism in the aorta and the renal, mesenteric, pelvic, and extremity arteries after discharge from the hospital with a diagnosis of atrial fibrillation. Arch Intern Med 2001;161:272-6. Bolderman R, Oyen R, Verrijcken A, Knockaert D, Vanderschueren S. Idiopathic renal infarction. Am J Med 2006;119:356.e9-12. Hazanov N, Somin M, Attali M, Beilinson N, Thaler M, Mouallem M, et al. Acute renal embolism. Forty-four cases of renal infarction in patients with atrial fibrillation. Medicine (Baltimore) 2004;83:292-9. Domanovits H, Paulis M, Nikfardjam M, Meron G, Kürkciyan I, Bankier AA, et al. Acute renal infarction. Clinical characteristics of 17 patients. Medicine (Baltimore) 1999;78:386-94. Suzer O, Shirkhoda A, Jafri SZ, Madrazo BL, Bis KG, Mastromatteo JF. CT features of renal infarction. Eur J Radiol 2002;44:59-64. Piffaretti G, Riva F, Tozzi M, Lomazzi C, Rivolta N, Carrafiello G, et al. Catheter-directed thrombolysis for acute renal artery thrombosis: Report of 4 cases. 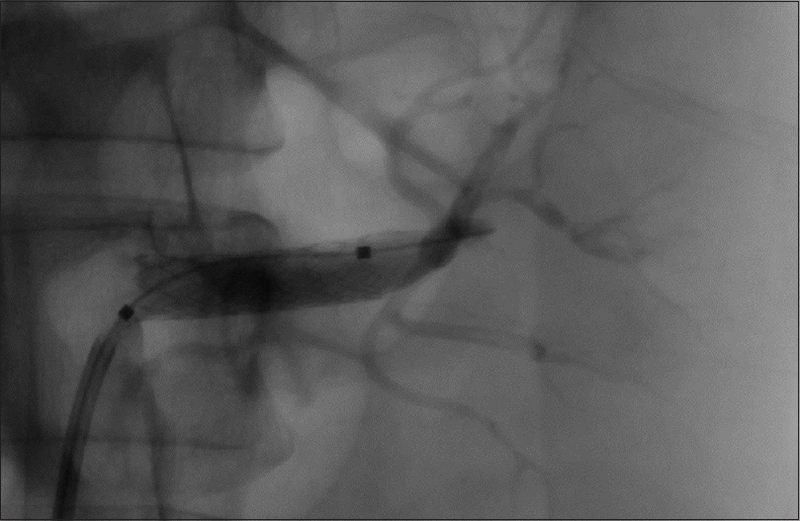 Vasc Endovascular Surg 2008;42:375-9.